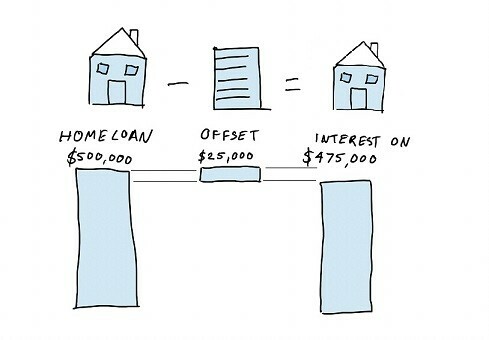 Using offset account properly are a really good way to reduce interest costs on your home loan. By having lower interest costs, you can use the extra money to pay off your home loan quicker. So how does an offset account work? An offset account is usually like a “normal” banking transactional account you can use for your day to day banking. The bank will link this account to your home loan in their systems to tell them it is an offset account. So what is the difference between an offset account and a normal transactional account? Because the bank links the offset account to the variable rate home loan, the amount of interest the bank will charge you on the home loan is the difference between your home loan balance and the amount of money you have in your offset account. For example, in the (awesome drawing) picture here, assume you have $500,000 loan and you have $25,000 in your offset account. When the bank calculates how much interest they will charge you, they subtract the offset account balance of $25,000 from your loan balance of $500,000 to get $475,000. You might not think this much, but over the life of the loan, if you had $25,000 in your offset account on a $500,000, you would save nearly 2 years off the life of the loan and about $53,500 in interest costs. It usually costs something to have an offset account. Some lenders include it in their annual package fee. Some lenders charge a monthly fee. Only a few lenders allow an offset account to be linked to a fixed rate loan. The fixed rate loan interest rates which allow offset account usually have a higher interest rate than fixed rates which don’t allow offset accounts to be linked to them. You usually will have an ATM card linked to your offset account. If your offset account gets big in size, you might not what to see that amount at the ATM. In this case, you might want to move the money in the offset account into the home loan. You might not actually need an offset account. If the costs of owning an offset account outweigh the savings, you probably don’t need one. You might want a more basic home loan product which might not have the extra fees.